Welcome to Studio Saturday! Each week one of our contributors gives you a sneak peek into their studio, creative process, or inspirations. We ask a related question of our readers and hope you'll leave comments! As an incentive, we offer a free prize each week to bribe you to use that keyboard. The following week we choose a random winner. This weeks winner is BeadRoe. Congratulations! You have won a bag of goodies from Erin Prais-Hintz! Send Erin an e-mail with your address and she will send you those treasures! This has been a hectic week here in my studio! I went to the Bead and Button Show (brought lots of goodies back in case you want to try for the Big Bead Giveaway! ), met with my book editor, did a video interview for promotional purposes down the road, met a million wonderful people, and did a bit of damage to a credit card I'd just paid off. But I was good, actually, compared to some years. Needless to say, my beading table and lampwork studio are either piled up with clutter or getting dusty. I'm behind. Soooo behind. 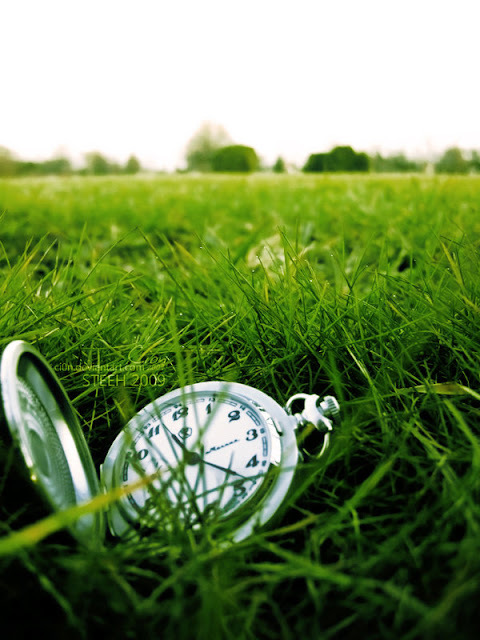 I feel like the White Rabbit in "Alice in Wonderland" .... "Late, late, for a very important date!" When I have so many things piled up and a ton of deadlines due, I tend to get, shall we say, frazzled. The running-down-the-street-waving-my-hands-over-my-head-screaming type of frazzled. So I've learned to set aside the deadlines, if only for an hour or two, and do something that gives my mind a break. Two things sooth this savage beast, and one actually helps me get the pile on the workbench under control. It's SO cathartic for me to pull out a box of beads and sort. Beads in too large a baggie get poured into a smaller baggie. Ahhhhh, there. Nice and tidy. Beads that are rolling all over the table, driving me (and the cats) mad, I scoop up and corral into their proper spaces. My mind can just drift, and I actually feel like I'm accomplishing something without having to think and plan and design and create and, and ..... and. Another thing I do when my brain is on overload and I need a mental break is make earrings. I sell a ton of earrings at craft shows and always try to keep at least 200 or so pairs on hand, so days when I'm overwhelmed are deemed Earring Days. This time of year, believe it or not, I start preparing for holiday earrings. My show season starts in mid-October, and patrons expect to see those snowflakes, so out comes the ho-ho-ho and away I go! I think we all have days when we're just completely overwhelmed with Life. Life has a way of sneaking up on us and yelling, "BOO!" in our ear just when we've thought things had settled down. It's always good to have a backup plan, and these are just two of mine. Depending upon the day, my backup plan could be a nap and a box of chocolates, but then, that would have been a short and boring blog post, now, wouldn't it? So here's my question to you -- what is your favorite way to recharge your batteries when you're overwhelmed with being a jewelry designer? Answer this question in a comment below, and a winner will be drawn at random next Saturday. The winner will receive a nice healthy helping of my Bead Soup, styled to your favorite color palette. Mmm, soup is good food! Funnily enough Lori I share your bead organising therapy - it's what I do when I can't sleep. You get so engrossed, time flies by and the brain is ready to shut down, plus you feel very virtuous. It's taken me a long time to learn that it's ok to step away from things for a while when the going gets tough and now I usually get in the car and head to the beach for a couple of hours of sea air - that usually sorts me out. At other times I will stick with the bead table, but push everything aside that's getting me stressed and design with no purpose. By which I mean I don't think about customers, saleability, (is that even a word?) photography or anything like that - I just wallow in creativity for a while and usually emerge refreshed and energised. Hope you catch up with yourself soon. When I need a break, I like to cook. A glass of wine and some cheese while I cook is even better. Sorting beads drives me nuts--I get all these ideas about what I want to do with the beads, and then I am just frustrated because I am sorting, not creating. Needless to say my studio is always a wreck. I like to edit my photos when I don't feel to creative or too much is going on to think clearly. I go on autopilot and fiddle until the pics look good. I, like you; like to organize my stash. I always find something I had forgotten I have, I have been putting my small amounts in little glass viles. I am a watercolorist and I like to mix color and do color studies. Yeah, sorting beads works for me too. Very therapeutic. But I have to agree with Erin about that it might be frustrating too, if I get lots of ideas. Also - If I feel way overloaded with musts I think through what it is I really HAVE to do, make a plan for that and then simply skip the rest. Yes! Skip skip skip! That's my melody! I can't believe you always have about 200 earrings in stock. But I guess if you are selling at craft shows you would have to do that. But I am impressed anyway. I go outside. Walk. Run. Breathe. Take in the season and refocus. Thank you for this chance to win something extraordinary. I'm a Police Communications Officer so my job is high stress. When I get home after a stressful day I change out of my uniform and pull up to my beading table, turn on my audio book, which right now is "The Girl That Kicked The Hornet's Nest", and start creating and loose all track of time. I don't do anything in particular- I am always organizing, so perhaps that would be a good answer. I clip projects from magazines so I can discard the rest. In all honesty reading is my very favorite escape. Not blogs, books. Hi Everyone, well when i get stressed from beading or anything Jack & i grab our fishing poles and head down to the peer and just throw the lines in, the sunset is gourgeous down there, we just talk & catch up on all the teen gossip i love that time with him and charish every minute. Thanks for the reminder that I should also be thinking of Christmas. I don't need 200 pair of earrings on hand, but I need some. What I do to recharge myself - I DON'T TORCH. I weed the garden, read a book, run, anything but Torch. It's looking like I need to recharge now. Beadweaving. This is my number one stress reliever. I can sit down in the evening after a long day and work those 3000 bead peyote patterns and forget about everything. I have no choices to make. The stitch is there, the bead colors selected...all I do is read the pattern and pick up beads. I actually start to get itchy towards the end of a pattern if I don't have another at hand or if the beads I ordered (no local source) have not arrived. 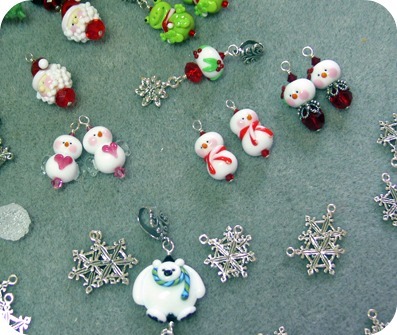 Another favorite is to coil wire or make little drop charms from single beads. I have been trying to love running for years and there is just no way. Sometimes yoga helps, but usually it is Delica beads and the peyote stitch. Like now when I see soooo many beads all over, I just ignore them like they're not there so I don't have to look at them and start thinking what I could create with this or that. I'll go do something completely different, or pull out a bead book or magazine. Think that's what I'll go do now! A nap is always wonderful!!!! Funny how sorting beads sooths so many of us. My mind goes blank for awhile and yet I feel productive. I sometimes get inspiration as I am sorting and make a new piece of jewelry. Most of those stressful overwhelm times send me to my laptop. I read your blog and some that you follow and then I feel refreshed and renewed. Looking through beads is therapy, but I also may bake, have a cup of tea and cookies with my girls, go to the beach (which is what we did today) or even just read. Right now things are pretty scary on my table...probably need to do some tidying up tomorrow! For me, stepping AWAY from the studio for a bit always makes me want to get back in there. Sometimes it's just a simple trip up to the bookstore for some coffee and a new beading magazine; other times it means some time on the water (either at the beach or in one of my boats.) I find that what is usually overwhelming me is the AMOUNT of stuff I have on hand to work with, so limiting what I use can also be very freeing. I knit... I try and keep a no brainier project on some needles. As am knitting along bead combinations just start flowing. Before long I'm ready to head back to the table and start putting things together. Add me to the "stress-sorter" group! I never do get completely organized though, because I always end up seeing something in a random pile of beads that will make me want to "just see what this will look like" and then I'm off and running. Right now I feel overwhelmed by everything and I have been having a lot of trouble sleeping so I am resorting to a really good book, Nora Roberts new release, Nibs; chocolate peanut butter cups, so much better than Reeses and a good long float in the pool today helped. Sometimes music with the headphones on lying flat on my back on the floor trying to keep my eyes closed helps too. Walking my dogs sometimes clears my head or at least helps me to see something other than the piles of unfinished projects around my house. Great topic - I am right there with you!! Sorting beads does it for me too! And when I'm having a really bad uncreative day, I do a complete clean up - everything gets sorted, organized (gotta love those little baggies), the floor gets vacuumed, and all the dust is swept away.... ahhhhh! Everything clean and put away! Love it! If the weather's nice I'll go out walking or horseback riding. I especially like to go out right after a rain when everything is still wet and shiny. Another thing I like to do is bookkeeping and inventorying - go ahead, tell me I'm weird! I already know it!! I'm not sure why but, crunching numbers is soothing to me and when it's all done I know how I'm doing and where I'm headed next with my business. To recharge my batteries I read a good book and do a little internet research. Seeing what everyone else is doing is sure to get the creative juices flowing again. I tend to do the same as you do, sort and put away beads that I have ben using or I get out new projects to do next.Playing with beads is always relaxing and fun for me !! When I want to step away from the beads, writing or reading is a good choice !! AHHHH, Bead Soup, My Favorite. No calories or fat. When I get overwhelmed I just simply STOP, rethink, and reset my priorities. Hmmmm i don't sell my work at the moment, so technically it's a hobby for me, so actually i've not felt that i need to take a break from beading, in fact i often feel i don't have enough time to bead, what with full time college and part-time work, in fact beading is a way of relaxing from those things. I do love to sort and tidy my beads though, we have issues with storage in our house at the moment, so i don't have as much space as i would like. I find designing in my sketchbook is a nice stress buster too, and logging onto etsy and flickr to look at every one elses beautiful and inspirational work. I like to clean up and forget about it. By cleaning up I see beads i may have forgotten about or color combos Laying together that work. This is sure to get the creative thoughts back. I've learned the hard way that I don't do good work when frazzled - the thread knots, beads fall on the floor, everything looks ugly, etc. It's far better to step away for awhile; for me, a long walk in the woods is a great way to "de-frazzle", it takes me out of myself and then I can go back to my project. To recharge my batteries, or just take a break from it all, I go out for a walk. 'hopefully, it's a nice day, I put music in my ears (my ipod in my pocket)and take a long walk, taking notice of all those little things that get passed by while driving in your car. Notice nature at it's best, in any season, take notice of the color nature produces, as well as the textures and dimension of trees, branches, flowers, pods, or seeds, acorns, etc. Then, refreshed, back into the studio to see how new creations are produced from designs in nature. Walking is both a mental and physical exercise for your body. I just need to do domething completely different. It doesn't matter what, just something completely unrelated. And then I come back with renewed energy and those are the moments in which I'm more productive. I don't know that I have any particular battery recharging technique. I think I just switch gears -- if I'm overwhelmed with beadweaving, I'll switch to designing a new pattern. If I'm tired of working on a pattern, I'll organize beads (don't we all spent inordinate amounts of time doing that?). We're in the midst of building a house, so I guess that's my recharging right now... going to work on the house and dreaming of the day when it'll be finished and all my beads can be in their "permanent" home. 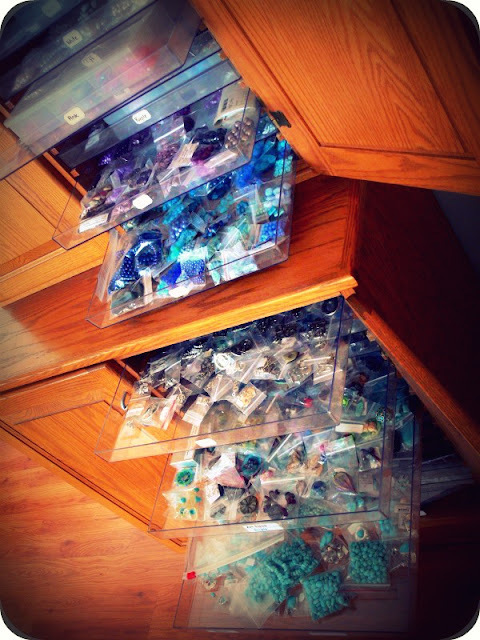 Like you, I recharge by sorting my beads table or just sitting down with a box of beads. Something about just looking and touching them is very cathartic. I do also find organizing a great way to get my mind off stressful deadlines. Lately I have been a proponent of the bead sorting therapy. I went in to clean up my copper and felt like I had really achieved something. Enough that I also ended up making a couple necklaces. Today since I have the house to myself, I plan on just going down to play. I wonder what will come out that. I love to read or watch reruns of Friends on TV. Makes me laugh and unwind. Otherwise I love talking to my best friend on the phone or spending time with my daughter. When I seem to be in a rut, or just frazzled, usually all it takes is a little inspiration to get me going again. Sometimes that's a trip to the bead store, sometimes it's finding something great online, and then there are times like now where all I really need is a nice trip in to nature. There's usually some task that I'm dreading - often a special request that I only said yes to because I friend asked. I just force myself to start working on something, usually a few pairs of earrings and then I move to the dreadful project and it never seems as bad! I asked an print artist that very question years ago and her answer was to work on your skills and techniques. That works sometimes, that or just walking away or digging and sorting old bits and putting things together in different ways. Making earrings works, too for some reason. When my creative juices need recharging I go to my bead stash and start sorting out like colors and complimentary colors, weird colors, etc which seems to get the juices flowing again. I relax and read a book! I pick up a nice thick (500 or more pages) sci-fi story. Reading an intriguing book usually gets my creative side thinking about what could be. I go to my Sons in his gigantic pool, or out with my Daughter. I also Lampwork which takes me a million miles away and that re~focus' me on my moving forward in that Journey. I do bead embroidery to recharge. I enjoy it so it is my break from making jewelry for inventory. I'm not sure I've figured out exactly how to recharge my batteries... :-) But a few things that I do are to take a break from all bead-related things (such as reading blogs, etc). Sometimes it is nice to truly get away from it altogether. I love to take pictures and look through them and spend time editing them. Taking a long walk is another favorite lately. Funny you should ask that question because I have pretty much avoided my bead desk for over a month until earlier this afternoon. Fair will be here in less than 3 months and I need to finish or even worse, start some of my six entries. I could of zoned out and played Farmville, in fact I started out the way. I told myself, if nothing else I'm going to sort out the stacks that are trying to fall over. So with soothing music from the radio, I sat down, closed my eyes and relaxed. I opened my eyes and started sorting. Sorting led to finding a focus item that went with beads I hadn't considered for it and then the findings to complement it. I packaged four sets to complete and finished a bracelet with matching earrings. So when I find myself thinking I have nothing to create it's a matter of sitting down, relaxing for a minute and then looking at it with a different perspective. You know, drawing always makes me feel better. Or, I can always make an updated "to do" list. Staying focused helps me feel calm. i love sorting beads too. I find letting everything else go and creating a new piece of jewelry-usually a necklace so healing. I try to stretch and make something different than I have in the past. And yes, I do not think about anything but the creation. Sometimes I don't like what I made when I look at it the next day, but the sense of satisfaction is still there. I think my stress or swirling emotions go into the piece I am making and that is where the peace comes. I grab one of the crime novels in my growing SUB and dive into another world. Cleaning up whether beads or other stuff is truly an effective way to boost confidence on days like these. I've learned the hard way that on days when I'm feeling, as you say, frazzled it's best not to attempt any kind of creative projects because it will end in tears and a lot of ruined material: fabric, wool or even chipped and cracked beads. So instead I either clean the house, now that it's warm outside, go for a walk or just do nothing. The last one being reserved for days when I'm really, really feeling down and/or agitated. I love sorting my beads too but funnily enough, I get more stressed looking at them. What works for me is to walk away from my beads and tools, set them in a place where I won't have to look at them and go read a book. Reading always calms me down. Right now, I'm stuck on a bracelet design and Alexander McCall Smith is helping me through the creative block :-). I do so wish that sorting out the mess in my studio was soothing. It might be tidier more often. I usually need to take a total break from my workspace and do something outside like walking, and lately gardening. It empties my head and makes room for new ideas. Yup, sorting beads works well. Also rolling out some metal clay and adding texture and shape. Cooking is good, baking to be specific. Or sitting with my hubby and watching tv for a bit, with our little Doxie girls on our laps of course! I have a really short attention span so always have a few things on the go at any one time that way I can swap if things arn't going the way I want them, If I really need to get away there is always house work to do or children to play with both are strangly relaxing! Hi Lori! When I get overwhelmed and need a break, I step into the internet world and read blogs! When I am stressed out and with flat batteries, or when I can´t sleep, I start sorting out photographies. It could be doing some scrapbooking, or on the compute,r or my favourite, my shoe box of pictures. I think that it is the fact that we normally take pictures of the good moments of life, and you see again friendly faces that make me feel better, as if those pictures are telling me that it's all worthwhile. I clean up my bead tray and look at the (small) stash I have then just browse the blogs for inspiration! Count me in the bead sorting group,too. Sadly, I do way more sorting than creating and I'm trying to get over that hump and start actually making things. The other thing I do is read blogs and all my beading books. I do it for inspiration but then I'm so over inspired, I can't decided what to do next and end up, again, doing nothing. This is not how I planned this new love of mine. I want to make stuff! So I know I need to read less and bead more. Hard to break bad habits, though. I like going through my beads too and sorting them, it gives me inspiration and reminds me what I have brought. I mix new colors of polymer, or roll swirl beads. Something about smooshing clay that helps me to relax. But honestly, your post makes me want to go and organize that pile of beads on my cabinet. Sigh. I suffer from disorganization as well with all the beady goods! I enjoy cleaning out stashes or baggies and attempting some sort of reorganization of my beads. This way I can inventory and often find old favorites. To recharge my design batteries I often take a walk or work in the yard. So much inspiration comes from nature. That is when I get out my little note book a friend gave me as a gift. I use it for lists. I was not much of a list maker but have started recently using my book when I am overwhelmed and it really seems to help. I think the part that helps the most is to be able to cross things off the list soo I actually feel like I AM getting something acomplished. Also my little book is Dr. Seuss and it makes me smile just looking at it and remembering the momement she gave it to me as it for not a special occasion. Thanks Becky for keeping me going and moving forward! I tend to clean when I am overwhelmed...bead table, kitchen floors, kitchen cupboards. I always feel a sense of accomplishment when I clean, which makes me feel better about myself, builds my self confidence, and I can get back to the work at hand. It's funny that a lot of us have sorting and organizing as our means of relaxing or clearing our heads. Somehow it is soothing and makes me feel like I have accomplished something when I get things sorted! I guess it is a mind thing! I don't really have a method - I like to look at my beads. I try to keep things organized as I go. But there usually is a small pile that needs to be sorted, especially after going to a bead show. Really, just looking at beads has a calming affect.Thanks for a chance to win a delicious cup of bead soup! If I get stuck with beading, I stop and join my husband wire wrapping. If I'm really stuck, I go camp on the Big Sur Coast and go jade hunting. If it's even worse, I go to the Eastern Sierra for a couple of days, wander around deserted mines. All of these work. I recharge my batteries by reading blogs and forums. Makes me feel like I am part of a big group with the same concerns and not so isolated. When I am feeling no inspiration whatsoever, I drag out my 7 year old niece and her beads (most of which I have given her). I will help her create something, or teach her a new technique (this weekend it was beginning wire!). I find that being able to look at jewelry through her eyes is a great way to recharge and see the world anew! I've been very lucky and found a TON of back issues of Stringing and Bead Style and Bead Trends and other beading magazines at my local book store for super cheap. Whenever I need to recharge, I reach for a stack of those - it usually inspires me! When I need an inspiration, I put my beads to the side and go out in nature or have a coffee with my friends, where I can quickly find new inspiration, sometimes on clothes of other people or in nature where I find great variety of color combinations.